and ENF social media pages to find out! 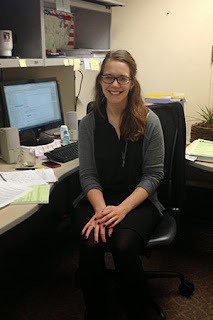 I started just over a year ago as a temp in Donor Services and have been the Communications Assistant since March. We’re celebrating Veterans Remembrance Month by sharing how Elks use Community Investments Program grants to serve veterans year-round. I especially enjoy reading how Elks have helped student vets, since many of them are my age. Their commitment to education and their communities is inspiring! I enjoy working closely with our Programs Department to share ENF successes through the ENF website, social media pages and mailings. I also work closely with the Development Department to put together ENFrontline, the monthly newsletter for ENF Chairs. Every day, I get to see how hard Elks volunteers work to support the ENF and serve their communities. My morning consists of drinking a lot of coffee and checking the ENF Facebook and Twitter pages to catch up on any action! My day always involves writing—letters, news releases, articles for the website, or updating our Facebook status. I’m thankful that it’s so easy to stay in touch with my friends and family that live in different states or countries. I’m thankful for my education. I’m thankful that I have a great job that allows me to live comfortably. I love crafts! Right now, I’m trying to think of great Christmas gifts to make for my friends and family. What book would you bring to a desert island? The Outsiders, no question. Stay gold, Ponyboy.